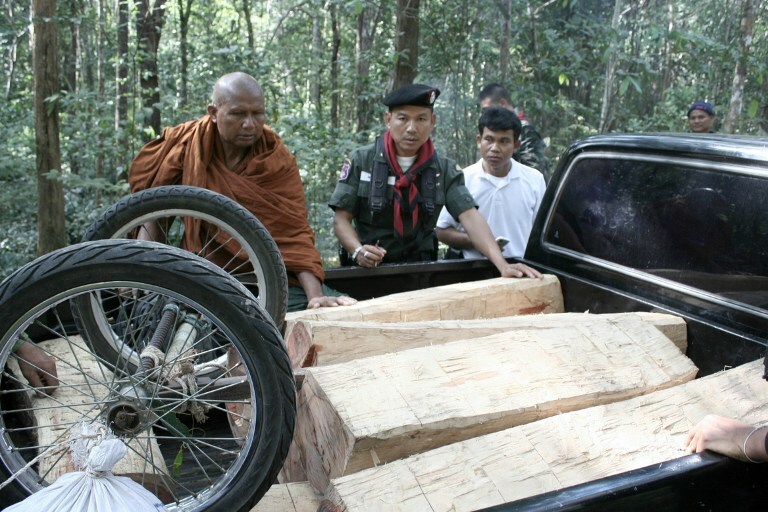 An abbot from Khao Sala temple in Thailand's Surin province inspects Siamese rosewood lumber seized from a group of illegal loggers, Nov. 4, 2012. Soaring Chinese demand for valuable Siamese rosewood timber is threatening the prized rainforest species with extinction in countries of the Mekong region, where illegal trade is driving corruption and weakening state governance, according to a London-based independent green group. From 2000-2013, some 3.5 million cubic meters (123.6 million cubic feet) of Hongmu (redwood) timber was imported by China, the only country to have a specific customs code for Hongmu species indicating the country’s “global dominance of trade” in the wood, the Environmental Investigation Agency (EIA) said in a report. The Mekong region—consisting of Vietnam, Cambodia, Laos, Thailand and Myanmar—has historically been China’s supply base for Hongmu and has been most affected by the surge in demand over the past decade, EIA said, accounting for nearly half of the imports since 2000 at a value of nearly U.S. $2.4 billion. It said that despite measures put in place by Mekong countries to prevent illegal and unsustainable logging, the value of the industry has rendered such efforts ineffective, and Siamese rosewood—a particularly rare form of Hongmu—is highly sought after by traders. “With rare timbers already threatened with commercial, if not biological, extinction, laws put in place to protect Siamese rosewood (Dalbergia cochinchinensis) have been swept away by corruption, driven by the huge financial incentives offered by timber traders supplying the Chinese market,” the report said. “Crime, corruption, and ill-conceived government policies from Thailand to China, via Laos and Vietnam, are likely to result in the demise of Siamese rosewood in the coming years, unless significant and rapid reforms are made,” the report said. Found in Cambodia, Laos, Thailand and Vietnam, Siamese rosewood is one of the most valuable and threatened of the 33 official Hongmu species, EIA said, adding that declines in the species’ population have prompted all four countries to put laws into place to prevent further logging. “Despite these controls, all of the range states have been hit by a predatory crime wave of illegal logging and timber smuggling driven almost entirely by booming demand for Hongmu in China,” the report said. “A combination of weak enforcement and corruption, soaring demand and the lack of a legality standard on China’s imports, has enabled the lucrative trade to flourish and has turned forests into conflict zones,” it said. Tom Johnson, a forest campaigner with the EIA, told RFA’s Khmer Service that with its booming market, China “is essentially exporting corruption and weakening forest governance in all of the range states” for all species of Hongmu. “Essentially, China is systematically eradicating the natural heritage of its neighbors,” he said. EIA said that when loggers seeking Siamese rosewood—many of whom carry guns and even rocket-propelled grenades in addition to chainsaws—are confronted by enforcement officers, violence often ensues. Since 2009, dozens of forest rangers have been killed in Thailand, the report said, though fatalities among loggers from Cambodia, who stream across the border under the cover of night to seek out rosewood, are even higher, with 45 reportedly shot dead by Thai forces in 2012 alone. Methamphetamines, which are used as stimulants to overcome fatigue, contribute to the violence and leave border communities ravaged by addiction. “The money on offer to impoverished rural communities from traders lures a stream of people willing to undertake potentially lethal work,” the report said. Rosewood is then channeled from remote forests to furniture showrooms in China, the report said, enabled by “major governance failings across all range states,” including weak and corrupted law enforcement and policy contradictions that provide mechanisms for trade at the expense of protection for the species. “The volume of money that is available within this industry is just staggering. And when you look at that in the context of the levels of poverty in many of the range states, you can see why it is practically impossible to stop this without addressing the demand and controlling imports to China,” Johnson said. “Enforcement alone isn’t going to stop this because the money available is so high that you are always going to be able to find people who are willing to risk their lives to go out logging and you are always going to be able to find government officials who are willing to take huge bribes to allow things to go out of the country,” he said. EIA recommended that all Siamese rosewood range states and China improve their reporting process to the CITES Secretariat, while all range states must end government auctions of seized rosewood and other species, prosecute those behind the illegal trade, and strengthen penalties to act as a credible deterrent. It said that Thailand must provide enforcement agencies with adequate resources to protect the country’s remaining stands, while Laos should utilize current negotiations with the EU for an agreement to combat illegal logging and trade in rosewood. Vietnam must prohibit exports of illegal rare timbers currently allowed if purchased from government auctions and processed into finished products, it added. EIA also called on China to institute a clear legal prohibition on imports of all illegally logged timber, deploy effective border controls on imports of Siamese rosewood, and to reform the Hongmu industry to ensure it stops stimulating demand for endangered species and trading in illicit timber. “China needs to step up to the plate. It needs to take responsibility for the way its trade operates in other countries, but it needs to take really robust measures to regulate imports—to determine whether imports of timber have been harvested and exported legally or not,” Johnson said. He said China should implement measures that other regions which consume large volumes of timber, such as the EU and U.S., have taken, but must also better regulate its own domestic industry. “There are huge problems with the timber trade in China generally, and its imports and this trade are symptomatic of that,” he said. Reported by Samean Yun for RFA’s Khmer Service. Written in English by Joshua Lipes.